This was such a beautiful dish! 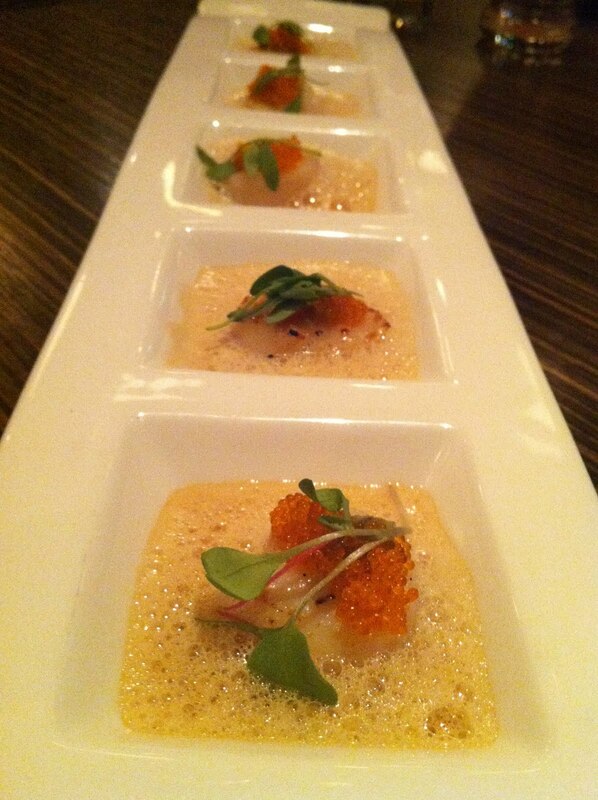 It’s hard to see the grilled scallops beneath all that foamy sauce and tobiko, but it’s there and it’s delicious! A bit on the small side, but you do get five them. I’m not sure what the leafy green garnish was, but like most random garnishes, it neither added nor detracted from the overall flavor. I did like the pop of green, though. I also wish I could have tasted the wasabi oil more because that would’ve added a nice punch to everything. The scallops were cooked perfectly and had such a soft buttery texture. A winning dish! This entry was posted in Restaurant, Tokyo Go-Go and tagged butter, Japanese, scallop, tobiko, wasabi by vicentesf. Bookmark the permalink.